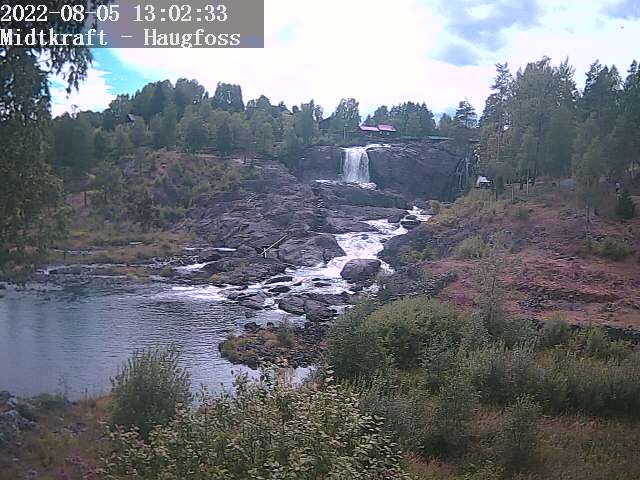 This is the view at Haugfoss right now. The Storehouse Shop the Nyfossum Director's Residencce has both a ticket booth and shop. However, you will find the majority of our wares in the cosy garden outside the shop. Inside the Storehouse Shop you can find a selection of our souvenir products and home accessories. Outside, we have big pots and pitchers, herbs and honey. With its extensive, well maintained garden, Nyfossum is an ideal place for a stroll. It is also a wonderful place for inspiration and ideas on what you could do in your own garden. Here you can find ceramic pitchers, pots and decorative pots, garden tools and fun things to brighten up your garden. We also have books on gardening, geranium cuttings and herbs. The garden at Nyfossum has a gazebo, carp pond complete with romantic little bridge, and several varieties of old apple trees. Nyfossen is a place to enjoy the peace and quiet of the beautiful green surroundings. It is a lovely place to sit down at a table in the garden and treat yourself to a cup of coffee and slice of cake or an ice cream. The Storehouse Shop serves simple snacks for anyone who wants to savour their time in the yard around the former Director’s Residence before visiting the elegant main house and art exhibition in the charming old timber barn.